If you are reading this right now, you probably know there is no shortage of blogs and bloggers giving advice on how to raise bilingual or multilingual kids. The great majority of these are based on parents’ own experiences raising their kids to speak more than one language, but only a handful of these blogs are written by someone who is able to actually cite research to support their views. Being able to cite research that has studied a given phenomenon helps to validate opinions, since readers can then be more assured that the advice being given may also apply to their own situation, instead of just being something that worked or did not work for a specific blogger. Veronika Laughlin is a blogger and researcher who takes this to heart. Her new blog, Bilingual Babies, is full of practical advice, based on Veronika’s raising of her German-English bilingual daughter in New Jersey, but also on her professional experience as a language research scientist at Educational Testing Services (ETS) in Princeton and on her educational background. Veronika has a PhD in Second Language Teaching and Learning. Veronika Laughlin with her husband Michael and her daughter, Ella. In this blog post, Linguacious’ founder and fellow PhD language learning expert, Victor Santos, interviews Veronika in order to find out more about her passion for helping families raise bilingual/multilingual children and about her research-driven new blog, Bilingual Babies. Victor (Linguacious): Veronika, thank you for agreeing to be interviewed for the Linguacious blog. You and I have met each other at several language assessment conferences in the USA and finally we now have the chance to collaborate and share our passion for helping families raise kids to speak more than one language. To kick things off, could you tell us a little bit about your language and professional background? Veronika (Bilingual Babies): Sure! Many thanks for the opportunity, Victor! After completing my Ph.D. in Applied Linguistics/TESOL at TU Dortmund University (Germany), I landed a job at Educational Testing Services (ETS) as research scientist in Princeton, New Jersey, in 2013. So I was very lucky to turn my passion for languages into a job. As a researcher, my main focus has been to investigate how to best improve instruction for English language learners. So, I guess, it’s not surprising that my private life is also full of different languages and cultures. I now live in New Jersey. I’m married to a native Hawaiian, and we have a little girl, Ella, who is starting to speak English and German and a few words of Spanish and Hawaiian. Victor (Linguacious): You are indeed very lucky to be able to turn your passion for languages into a job (makes two of us!). I am sure you are actually better at your job because of it. When we work with something we are passionate about, that is the perfect synergy, isn’t it? In addition to working as a language researcher at ETS, you have also recently started your own blog. Could you tell us a bit more about what made you start Bilingual Babies and how would you say it differs from other blogs about raising bilingual kids? “What’s the best way to expose Julia to a different language?”. In the beginning, I found myself struggling with a response. I took a relevant course in college years ago, but bilingual first-language acquisition is not something I directly deal with in my job. However, since I read research reports and academic publications on a daily basis, I started to read up on the latest research in the area. Then, when I became a mom myself two and a half years ago, all of a sudden things became very real! I noticed that some parents were struggling and in some cases even gave up on the idea of raising their children with multiple languages. Which leads me to 2018 when I decided to start Bilingual Babies to share my personal experiences and knowledge from research in order to provide a platform of information, tips, and resources for bilingual families. On a weekly basis, I publish new posts in different categories that include knowledge-based articles (ABCs of Bilingualism) and posts about experiences and ideas for making language a main part of a family’s life (Bilingual Living). I also provide reviews of products and share resources for German and English that we use in our family (Resources). Actually, one of my recent product reviews was precisely on the Linguacious German Around the Home flashcards! A new category called “Parents Voices” was recently added to the blog in which I interview parents from around the world about their experiences, challenges, and advice about bilingual or multilingual parenting. Victor (Linguacious): It’s interesting that one of the reason why you started your blog was because you wanted to be able to better answer questions that parents had been asking you. What common challenges have you noticed parents go through who want to raise or are raising their kids to speak more than one language? Veronika (Bilingual Babies): There are a number of challenges. It’s actually quite interesting how parents from around the world encounter similar challenges raising bilingual children. One challenge I have noticed from conducting interviews for my “Parents’ voices” section of the blog is how to create the need to use the minority language. If we think about it, communication is a system that is based on efficiency. We tend to convey meaning in the quickest way possible. For example, here is the United States where English is the absolute dominant language, many parents struggle to create the need for their children to speak the minority language. I’m one of those parents! In our household, I speak German to our daughter, Ella, all the time. My husband only speaks English and Ella hears English at daycare. So she hears English a lot more than she does German. Plus, I’m communicating in English with my husband so Ella knows that I speak English too. So why speak German when mommy can understand English, right??? Creating a need for children to use the minority language is a crucial part of increasing their odds of learning that language. So, as a parent who is trying to help the child develop the minority language, you have to be creative and come up with situations where your child needs to communicate in the minority language. In our case, we FaceTime with grandparents in Germany a lot, we visit family abroad, we attend a German-speaking music group once a week, and we read German books every day. So it’s a consistent work-in-progress to create these environments and situations that require and thus promote meaningful communication in the minority language. Victor (Linguacious): Indeed! It takes a lot of effort, creativity, and determination to create these suitable language environments for our kids if we want them to succeed in learning and caring about our languages. It’s the same struggle at the Linguacious home, where we are raising our son Dylan trilingual with Brazilian Portuguese, Russian, and English. It’s the daily effort we as parents put into it that will make all the difference down the line in terms of ensuring that we are raising bilingual or multilingual kids who not only speak more than one language well but who actually care about our culture(s) and language(s) as well. Maybe one day they themselves can hopefully pass those languages down to their own children, making our effort all the more worthwhile and helping create a more multilingual and culturally and cognitively rich society. Despite our dreams for raising our kids speaking more than one language, some people say that with advances in language learning and translation technologies such as Google Translate at our fingertips, there is no longer much value in having kids be proficient in more than one language nowadays. We even see this in recent proposals that computer programming in schools be counted as fulfilling a foreign language requirement (Inside Higher Ed, 2017). What would you say to these people who believe that learning languages is not longer so useful? Are all the translation technologies making language learning less useful? Veronika (Bilingual Babies): I would caution against conclusions such as “we don’t need to learn languages anymore because technology can help us communicate.” First and foremost, while technology has made incredible advances in recent years, it is still not at the point where it can be used to have a fluent, spontaneous, and meaningful conversation. My husband, for example, uses Google Translate to interpret restaurant menus when we are in Germany, but when it comes to using it in a conversation, the pace of a natural interaction tends to be way too fast for Google Translate to keep up. So, in a nutshell, Star Trek’s universal translator is still very much a utopian ideal. Second, research has found that speaking more than one language may come with a number of cognitive advantages. One interesting finding (Bialystok, Craik, & Freedman, 2007), for instance, is that bilinguals tend to develop dementia or Alzheimer’s disease on average 4-6 years later than monolinguals! While the rate or pace with which the disease progresses seems the same in both monolinguals and bilinguals, bilinguals developed dementia later in life than monolingual patients. So that may be a clear benefit in favor of learning languages, out of many others documented by research. Another advantage of being bilingual is that bilinguals are better at social skills. Researchers at the University of Chicago (Fan, Liberman, Keysar, & Kinzler, 2015) conducted an experiment that required children to take different perspectives. They presented 4 to 6-year old children with different language backgrounds (monolingual children, bilingual children, and “exposure children”, that is, children who are only exposed to another language regularly but don’t speak it) with a situation in which the children had to consider someone else’s perspective. 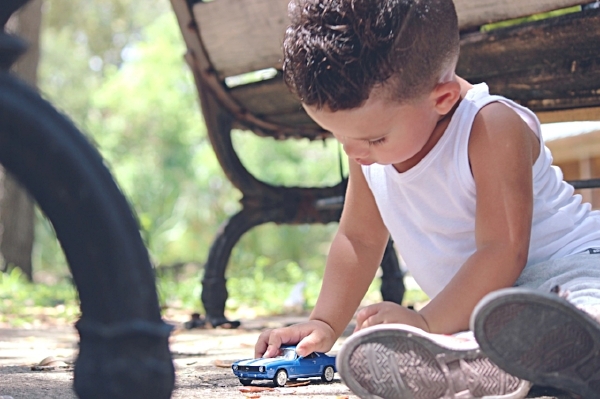 In the experiment, a child could see three toy cars: a small one, a medium-sized one, and a large one. Also, they could observe that the adult could only see the medium and the large car. So when the adult asked “Oh, a small car. Can you move the small car for me?”, bilingual and “exposure” children would more often reach for the medium-sized car. As they took the speaker’s perspective, they understood that the medium-sized car must be the one the adult was referring to given that the adult could not see the smallest of the three cars. The Chicago study was repeated with 16-month old babies with similar results (Liberman, Woodward, Keyzar, & Kinzler, 2017), suggesting that even quite early exposure to multiple languages may enhance communication skills. If we think about it, these findings make total sense. Bilingual children and those children with regular exposure to another language grow up considering context and different perspectives. They constantly have to evaluate: (a) who speaks what language? (b) who can understand what language?. So they basically practice taking the viewpoint of others all day long. So, overall, technology has and most likely will— to an even greater extent than we see now—provide support for language learning, but not replace it. Plus, it may help with a basic form of communication such as deciphering the menu in a restaurant in another country. However, being able to really communicate and interact with other human beings in a different language (not to mention a different culture) is something that technology cannot yet do for us. Additionally, the cognitive and social benefits that come with being bilingual cannot be provided by any form of technology! Technology has and most likely will provide support for language learning, but not replace it. In short, I am a firm believer in keeping up the efforts to give our child the gift of multiple languages so they can meaningfully interact with a larger number of people in this world. Victor (Linguacious):: I could not agree more, Veronika. Now, since we are talking about technology and about resources that can help others learn languages, what are some of the German resources that have been useful to you in your goal of raising Ella bilingual? 3) The Linguacious German vocabulary flashcard game, which also offer audio by a native speaker of German. We have both the Around the Home and also the Animals version of the flashcards. Victor (Linguacious): Veronika, thank you so much for your time to talk to us. We really appreciate the work you are doing with Bilingual Babies! Any last thoughts you would like to leave readers of the Linguacious blog with? Veronika (Bilingual Babies): It’s been a pleasure! As for my last words, I would say that raising children with multiple languages as well as teaching languages is a marathon, not a sprint. It may seem daunting at times, but in the long run, it is well worth it! One thing that might be good to remember from time to time is to make language learning fun and engaging. If it is fun and simply ‘feels good’ to use the minority language, children are more inclined to interact in that language. So encourage and ‘push gently’ while keeping things fun and engaging! Inside Higher Ed ( article by Scott Jaschik, 2017). Computer Science as (Foreign Language) Admissions Requirement.